Let’s dive right in and take a look behind the scenes! This is what I wanted to achieve in the past few months, and now it’s here, yay! Each one of the entries in the list, which is the value of data in the JSON object, contains information about a certain “food event”. 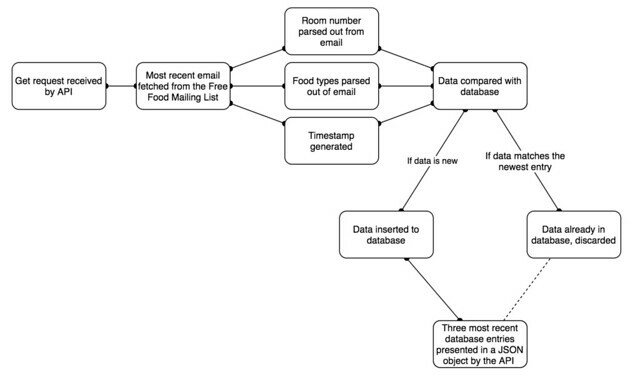 The information contained in each event includes the location of the food, its type, and a timestamp. The API only exposes the 3 most recent database entries, though the rest are safely stored in the dungeons of the internet, waiting to be used in some cool statistics project in the future, when they will become a big enough data set. After about 3 cycles of development, I ended up with the current solution, where I use RegEx to look up a commonly used room number structure in the emails. It ended up actually being pretty simple, and pretty reliable so far too! You may wonder what happens if the RegEx matching function fails to find any room number, and rightfully so! In that case, another function will iterate through a list of “special rooms” that might have been included in their non-standardized form. A match between the email’s text suggests that this room name contains food. The food-type parser works in a similar way. A long list of foods is being compared to the email’s body. Any match between a food type keyword and the message is being added to the “food” item in the API’s output. And the timestamp, is, well, a timestamp. EXCITING. I know. Even though it’s really interesting, I will not describe the program in more detail. I wanted to illustrate the general workflow, and the whole chunk of code can actually be found on my gitHub page!